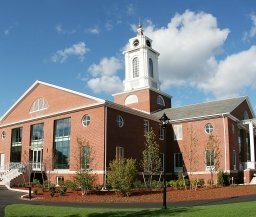 Bentley University is preparing students for career and life success, because business is everywhere. Businesses today are creating sustainable energy, developing life-saving drugs and inventing new technologies each day that change the way we live. A Bentley education prepares students to succeed in any field through a distinctive fusion of business and the arts and sciences. Students look at the world through a broader lens that embraces fusion and innovation, technological mastery and cultural literacy, practical expertise and the ability to effectively communicate with others. Bentley graduates know how the world works, and how it thinks. Because that's what it means to prepare at Bentley--and to leave Bentley prepared for anything. When you come to Bentley, you will join a group of global and talented individuals who understand and apply information to decision-making, use the latest technology, know how to connect people and ideas, and operate comfortably with ambiguity and risk. 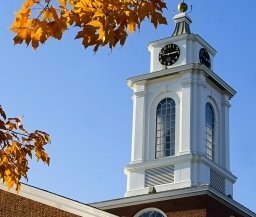 Bentley University accepts the Common Application. Candidates for the fall semester are notified by the end of March; spring semester candidates and transfers are notified on a rolling basis. The Bentley curriculum is a unique fusion of business and the liberal arts. The university's 4,200 undergraduates benefit from a breadth of programs and the ability to combine subjects to best fit their interests. A Bentley education also focuses on gaining hands-on experience in the classroom. Students benefit from classes where they partner with outside companies to solve current business problems and present their solutions directly to company executives. Bentley also offers top applicants a chance to enroll in the Honors Program. Participants select honors-level courses each semester that offer extra intellectual challenge in a seminar atmosphere. The Bentley curriculum is a groundbreaking integration of business and the arts and sciences that has been featured in the Wall Street Journal. "It's not about pitting lifelong learning skills against professional skills," President Gloria Larson told the paper. "A college degree should reflect both." To that end, Bachelor of Science (B.S.) degree programs enable our students to gain in-depth knowledge and skills in specific business disciplines: accountancy, actuarial science, computer information systems, corporate finance and accounting, creative industries, economics--finance, finance, information design and corporate communication, information systems audit and control, management, managerial economics, marketing, mathematical sciences and professional sales. Bentley also offers Bachelor of Arts (B.A.) 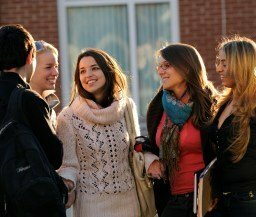 degree programs with majors in global studies, health studies, history, liberal arts, media and culture, philosophy, public policy, Spanish studies, and sustainable science. All Bachelor of Arts students gain business experience through either the Business Studies Major (BSM) or minor. All students can also choose from minors such as entrepreneurial studies, law, and sports management. The Liberal Studies Major (LSM), an optional double major, can be combined with any business program. It provides students with a competitive edge by building meaningful connections across and within disciplines. To complete the LSM, students do not need to take any extra courses beyond those normally required. It allows students to add another credential to their degree, helping them stand out to employers. LSM concentrations include American studies; diversity and society; earth, environment, and global sustainability; ethics and social responsibility; global perspectives; health and industry; media arts and society; and quantitative perspectives. 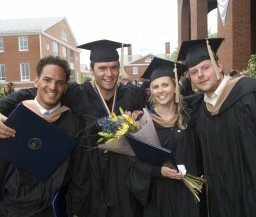 Bentley University boasts one of the country’s top business programs that looks to send technically-skilled, globally-minded graduates into the real world (at a 97 percent job placement rate, no less). The curriculum at this just-outside-Boston school is heavily stacked with the liberal arts, and even though most everyone is here to get a business degree, there is “a vast number of perspectives, beliefs and strategies...that it is incredibly helpful in understanding course material as well as staying intellectually involved outside of the classroom.” Still, the business classes are the core of a Bentley education, and they allow every student “to understand and be prepared for all aspects of the business world, including finance, marketing, accounting, operations, and statistics.” There are “plenty of opportunities to incorporate liberal arts into your education and create a major and minor combination that best suits your interests.”Professors are “excited to teach and even more excited to engage in meaningful conversation with their students and peers.” As students reach senior-level courses, teachers are “truly interested in helping to set you up with work and recommending you to some of their connections.” A low teacher to student ratio further helps to create more personal relationships between professors and students. “All of my professors know my name,” one student tells us. The alumni network is similarly useful and “easy to get involved in.” A lot of the information that is taught is “also applied through case studies and working with local businesses,” and group projects are common. Around 90 percent of students take advantage of the school’s internship opportunities (the majority do so multiple times), and resources are plentiful all around: “There is always someone I can talk to if I feel the need,” says one student. Through internships, student activities, and countless opportunities to network, Bentley does a lot to serve its “motivated students seeking high quality business education.” On average, the starting salary of a graduate is an impressive $62,900 per year, according to PayScale.com, with 36 percent of them noting that their work has high meaning to them. 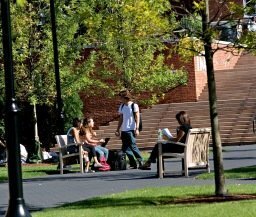 Given that this is a business-oriented school, most students feel particularly supported by a Career Services Office that “does a great job in placing in internships as well as full-time jobs.” Bentley is an institution that, as one student puts it, “is all about knowing what the business world wants” and “sets out to create the best for its students” as they step into the professional world. 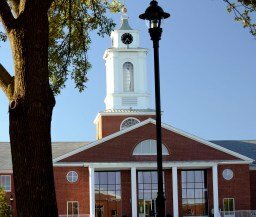 Bentley's financial aid program includes both scholarships based on academic achievement, which are awarded through the admission process, as well as grants based on financial need. Bentley administered over $95 million in aid to undergraduate students last year. More than 75 percent of aid came as Bentley-funded grants and scholarships. Significant institutional resources are committed each year so that all academically qualified students have access to a Bentley education regardless of their financial resources. Currently, more than 70 percent of undergraduates receive some type of financial assistance-including grants, scholarships, loans and/or work study. 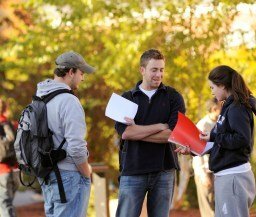 Approximately 98 percent of freshmen live on campus. Twenty-three residence halls provide a range of housing options: dorms, suites, and apartments. Housing is provided for all four years; all residence halls are air-conditioned and typically include study lounges, exercise facilities, TV lounges, and game rooms. Students live and learn in a multicultural environment that prepares them to thrive in today's diverse world. International students representing nearly 100 countries make up about 25% of the student body and bring valuable perspectives to the Bentley community. Supporting Bentley's commitment to diversity are offices such as the Multicultural Center, Spiritual Life Center, Center for International Students and Scholars, Equity Center, Center for Women in Business, and the Women's Center. The Student Center is the hub of campus activity and is home to 921 Dining Room and more than 100 student organizations. These groups represent academics, the arts, media, fraternity and sorority life, and cultural interests. 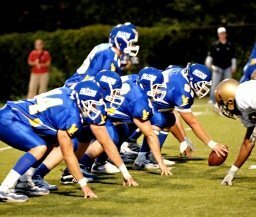 Athletic programs are a Bentley hallmark and include intramurals, recreational sports, and more than 20 varsity teams in NCAA Divisions I and II. The Dana Athletic Center houses a weight and fitness complex, food court, locker rooms, a gym, a basketball court, volleyball and racquetball courts, a competition-size pool with a diving tank, and saunas. Outdoor facilities include soccer and baseball fields, a track, and tennis courts. In 2018, Bentley opened our new, state-of-the-art multipurpose arena which hosts our NCAA Division I hockey team and prominent university events such as career fairs, high-profile speakers, alumni events and concerts. The 76,000 square foot facility marks Bentley's continued rise as a modern, nationally-recognized business university and is a prime example of sustainable design and energy efficiency. Bentley is filled with “highly ambitious” students who find it refreshing to be surrounded by “people who want to be successful and are willing to put in the work to achieve success.” The student body is predominantly white (“very preppy, a lot of pastel colors”) with a relatively high guy to girl ratio, and “lots of students have money.” Everyone in this “very cohesive and cooperative group of students” gets along and is friendly to each other. The college guarantees on-campus housing for all four years and most of the student body takes advantage, “creating a tight knit community” where there is “a big sense of belongingness.” “It feels like living in a hotel with all of your friends,” says a student. Bentley's location in Waltham, Massachusetts-just minutes west of Boston--puts the city within easy reach. As the country's ultimate university town, Boston's options range from theater to art exhibits, dance clubs to concerts, and championship sports to world-class shopping. Bentley's free shuttle makes regular trips to Harvard Square in Cambridge, just a subway ride from Boston. 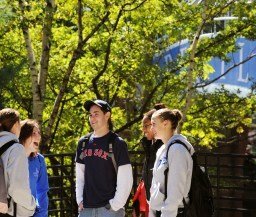 Boston also offers many opportunities for internships and jobs after graduation. Concepts taught in the classroom are put to use in several high-tech learning laboratories. Bentley's financial Trading Room combines state-of-the-art technology and real-time data to offer first-hand exposure to financial concepts in simulated trading sessions. Resources include Bloomberg, Capital IQ, Datastream, FactSet, Thomson One Analytics, Portfolio Analysis, MATLAB, S&P Compustat, and Worldscope. 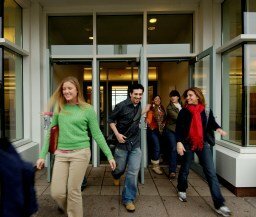 The Center for Marketing Technology plays an integral role in marketing programs. Students gain a full grasp of software options, familiarity with research tools and techniques, and knowledge of new digital marketing frameworks. The Accounting Center for Electronic Learning and Business Management (ACELAB) introduces cutting-edge technologies that are reshaping the accounting profession. Students have access to auditing and tax preparation software as well as other professional applications from industry leaders such as SAP and Oracle. The Computer Information Systems (CIS) Sandbox is Bentley's technology social learning space where students gather to collaborate on projects, work one-on-one with tutors, participate in IT workshops, build mobile apps, create video games, and explore new technology trends and devices. The Center for Languages and International Collaboration (CLIC) is a key resource for language courses, international studies majors, and students with an interest in global issues. The center promotes collaboration among Bentley students and their counterparts overseas. The Media and Culture Labs and Studio feature resources for video production and editing as well as digital photography. The lab provides students with industry-standard software programs for screenwriting, sound mixing, graphic design, and DVD authoring. 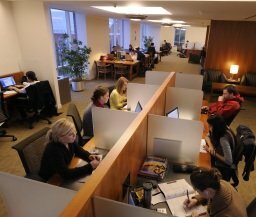 The Bentley Library is outfitted with computer workstations, group study rooms, and wireless network access. It also has an exceptional number of online database resources. 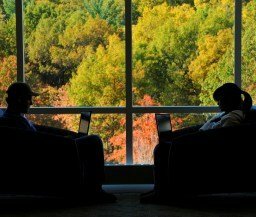 In 2010, Bentley was ranked 14th on the Princeton Review's list of best college libraries. Hands-on experience is emphasized across the curriculum. Internships, study abroad, service-learning, and other opportunities allow students to apply classroom theory in the community. More than 90% of seniors complete one internship and over 70% complete two or more, building valuable work experience and networking connections. Some of the top internship employers include Fidelity Investments, the TJX Companies, Liberty Mutual, Bain & Company, and all of the Big Four accounting firms. Bentley students can gain insight into different cultures by studying abroad. Programs take place in more than 25 countries and vary in length from one week to a full academic year. Through Bentley's Service-Learning Center, students build skills in business, communication, and teamwork while assisting nonprofit and community-based organizations both locally and internationally. 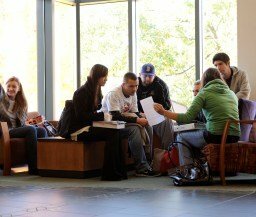 Weekdays are generally filled with class and homework, with “relaxation periods towards the end of the day and usually spent eating off campus or in a dorm room.” During week nights, “there are a lot of group project meetings as many classes here have an emphasis on teamwork skills” and athletic games also receive a lot of support. A “multitude of extracurriculars” are there for the taking (many even have a business slant, such as the the Bentley Investment Group and Bentley Microfinance Group), and many students are active and “enjoy playing games like soccer or frisbee...on the green spaces.” Additionally, there are always events going on “like guest speakers and games like trivia night in the student center.” This is a pretty campus, and “daily fitness routines at the gym” are also on the schedule for most. Bentley organizes intramural sports, and going into Boston is a fun jaunt for those who can spare the time, with a free hourly shuttle making it easy to get to Harvard Square. With two dedicated full-time sustainability staff members and five student interns in the Office of Sustainability, Bentley University is equipping it students to tackle environmental challenges as future business leaders. Every year since 2012, Bentley has reinvested a small percentage of savings from energy efficiency projects into offsite wind power via the purchase of Green-E certified renewable energy certificates. The wind power purchase is helping Bentley achieve its 2015 GHG reduction goal of 50 percent (against a 2008 baseline). Operational efficiency is also a key strategy for GHG reductions. Each summer, one residence hall is renovated with an emphasis on increasing water and energy efficiency through the installation of low-flow bathroom appliances, high efficiency boilers, LED lighting, and energy management system upgrades. Nearly all of the outdoor lighting on campus has been replaced with LED fixtures. A successful single-stream recycling program combined with a new composting program has led to an increase in waste-diversion from 17 to 35 percent. Student Eco-Reps host sustainable events for their respective residence halls and created a Green Certification Program to audit academic departments, administrative offices, and student organizations based on sustainability criteria. A group faculty and staff Eco-Reps serve as sustainability champions within their offices. The Manager of Sustainability also collaborates with the student-run Bentley Green Society. Bentley recently introduced a sustainability science major to accompany the existing major in earth, environment, and global sustainability. The university views career development as an integral component of its sustainability plan and has a career advisor dedicated to programming and outreach for sustainability-related jobs. Bentley provides shuttle service from Harvard Square seven days a week. Logan International Airport in Boston is 12 miles from our campus, with transportation available by Uber, taxi, MBTA trains and buses as well as rental car. Amtrak offers frequent passenger service to South Station in Boston from all points along the Northeast Corridor. Public transportation is available from South Station to campus. For international freshmen students a bus is available to pick up from the airport for first year students prior to Orientation. Visit our website at: http://www.bentley.edu/about/directions for more information on getting to campus via various modes of transportation.